By Reno Home Blog Team on August 15, 2007 11:42 PM | Your Thoughts? Basing it from Jan 2007 to May 2007, the Sparks home sales market is moving sideways. Even gaining an upward momentum from April to May. I wonder if this sideways movement will continue. Time will tell. For some reason while creating this graph I was painting a different picture in my head of how the Sparks market is performing this year. This just tells us that numbers are better than opinions/assumptions. 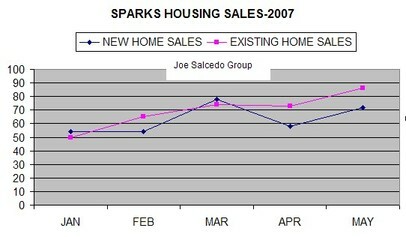 Based on this graph, In 2007 (Jan-May), Sparks home sales is moving steadily in neutral ground. Time will tell if this will be sustainable. Keep observing what the market will do. If you were to base it solely on this data It is not wise to conclude that the Sparks market has bottomed. Still too early to tell. This page contains a single entry by Reno Home Blog Team published on August 15, 2007 11:42 PM. Sparks Marina Park was the previous entry in this blog. Reno Single Family Residence Sales-2007 is the next entry in this blog.